Frances Glessner Lee was born in 1878, the heiress to the International Harvester fortune. Although she was born in Chicago and grew up in the architecturally renowned Glessner House, she lived much of her later life in Littleton, New Hampshire. Young Frances was educated at home with her brother, but despite having an interest in law and medicine, she was mostly taught the domestic arts. She wasn’t permitted to attend college when her brother continued on to Harvard, and instead, as was typical for a young woman of privilege at that time, she was officially presented to society at age 19. Just three months later, she was married off to attorney Blewett Lee, a distant relative of Robert E. Lee. Her married life seems to have been unextraordinary. She produced three children with her husband, and seems to have basically lived the life expected of her. It wasn’t until she was middle-aged—her children grown and her husband having divorced her—that she gained the freedom to pursue her real passion: forensic science. She had first become interested in the subject through conversation with her brother’s Harvard classmate George Burgess Magrath, who eventually became a Harvard pathology professor and a medical examiner. She learned, through him, of the challenges faced by criminal investigators, of how the police and coroners were relatively untrained in death investigation and the preservation of evidence, leaving many murderers to go free. 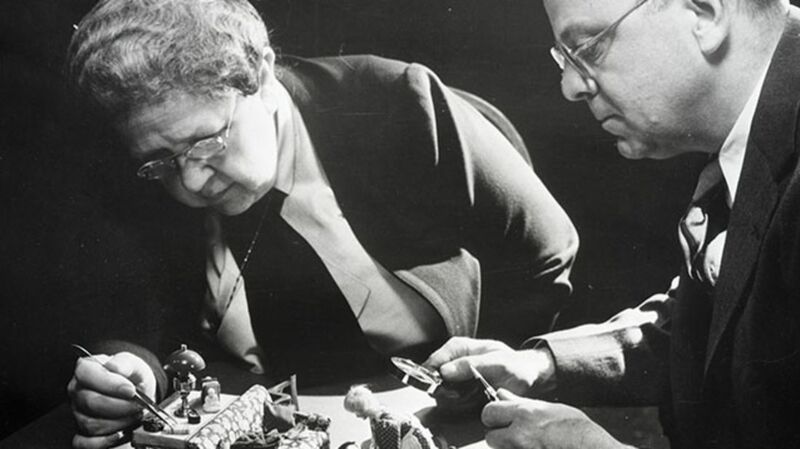 In the 1930s, she also began spending her leisure time doing what would at first appear to be a very feminine and respectable hobby for a woman of her age and social standing—constructing dioramas of dollhouse miniatures. They were whimsical, tiny scenes, with people and furniture, in proper dollhouse scale. A closer look, though, reveals that her little rooms depicted real crime scenes, complete with dead bodies, murder weapons, blood spatter, and every element of the aftermath of a killing. She studied the case files of real New England crimes for her constructions, and included all the clues necessary to solve each crime in her dreadful doll houses. Some of the dolls, for example, were designed to show effects of rigor mortis and lividity, from which time of death can be estimated. In one case, a tiny bullet is lodged in a rafter, for only the most eagle-eyed investigators to find. She called her dioramas the Nutshell Studies of Unexplained Death. She put so much intricate work, expense, and care into each one that she was only able to construct a few per year. Once, when she needed material for a pair of miniature pants on a figure, she wore an old suit around, even though it was out of fashion, so she could ensure the material was worn in to the proper, realistic degree. She even hand-knitted the socks for the figures, using knitting needles the size of pins. It’s telling that most of the victims in her dollhouses of death are women, and that they are shown in their homes, with kitchens and babies, in the realms of domesticity that she herself may have chafed against. In the 1930s, once she came into her substantial International Harvester inheritance after her parents and her brother had passed away, she used some of her vast fortune to endow the Department of Legal Medicine at Harvard. The purpose of the department was to help Massachusetts police use medical investigation to solve unexplained deaths, and to further the use of skilled medical investigators instead of “laymen coroners.” Glessner Lee also instituted a weeklong seminar on forensic science in partnership with Harvard University in 1945, which is still held every year. The Harvard Associates in Police Science training program also still uses the Nutshell Studies to provide instruction to cops, private investigators, medical examiners, and other professionals studying forensic investigation. Her efforts to ensure quality training for death- and crime-scene investigators encouraged a move away from untrained coroners in many states in favor of highly trained medical examiners. In recognition of her achievements, in 1943, she was named State Police Captain of New Hampshire—the only woman in the country with the honor at the time. Today there are 19 surviving Nutshell Studies, 18 of which are kept in the Office of the Chief Medical Examiner in Baltimore, Maryland, where they are still used to teach. While not technically open to the public, private showings can sometimes be arranged. Glessner Lee used the privilege afforded to her, in combination with the domestic activities and crafts expected of a society matron, to transcend the gender norms of her era and station. She is sometimes referred to as the "Mother of Forensic Science." All images courtesy Maryland Office of the Chief Medical Examiner except where noted.